Renaissance, renewal, innovation – will this current era of Detroit development generate sustained change? and for whom? Great map. I’m not sure all of the University City renewal projects were actually carried out. Some of them were – including demolition for the current Wayne State athletic facilities – but I think residents of the neighborhood now known as Woodbridge were able to turn back some of the planned demolition. 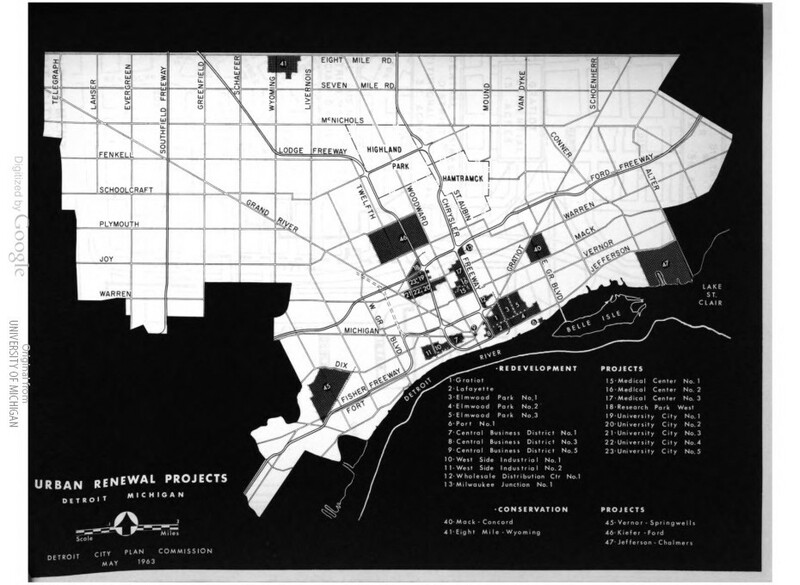 The “West Side Industrial District” renewal area wiped out the southern half of what eventually became Corktown; I believe it replaced mixed industrial-residential areas with the low-rise, 1950s industrial-commercial buildings that predominated in that area today, some of which have now themselves been repurposed (e.g. Detroit Hispanic Development Corporation, Le Petit Zinc). I believe neighborhood resistance in Corktown also prevented further demolition, so one might say that the neighborhood gentrified in spite of urban renewal, rather than because of it. The “Conservation Districts” are something I wish I knew more about. I believe the late Mel Ravitz, later of City Council, helped to get the Mack-Concord district going when he was a Detroit city planner. It would be interesting to compare the remediation strategies used in these districts with those used later in everything from the Skillman “Promise Neighborhoods” to the Detroit Future City stabilization areas. The Kiefer-Ford district is of particular interest, since it would go up in flames just four years after this map was created.